Welcome to the Spring Cleaning With Shark Giveaway! Read Becky's Shark Blast and Scrub Steam Mop Review. 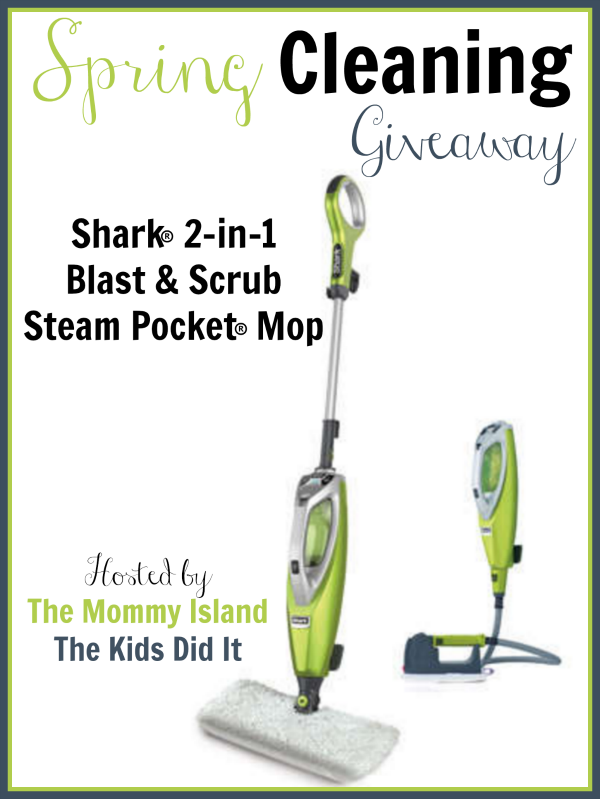 Enter The Shark 2-in-1 Blast & Scrub Steam Pocket® Mop Giveaway! One lucky entrant selected by the giveaway form will receive the Shark 2-in-1 Blast & Scrub Steam Pocket® Mop ! (ARV $140) Open to readers in the US, 18 years and older. No PO boxes. Open for entry from 3/17-3/31/16 at 11:59pm EST. Winner will have 24 hours to respond to notification email to claim their prize or a new winner will be selected. The Mommy Island, The Kids Did It, and participating bloggers are not responsible for prize fulfillment. The toilet is my least favorite thing to clean... yuck!! My least favorite thing to clean are the floors. It just takes forever and it hurts my back. I also loathe doin laundry.